Peak flow allows you to assess respiratory health by providing a snapshot of lung function. It measures the air flow you can achieve when exhaling as fast as possible after inhaling as much air as possible. 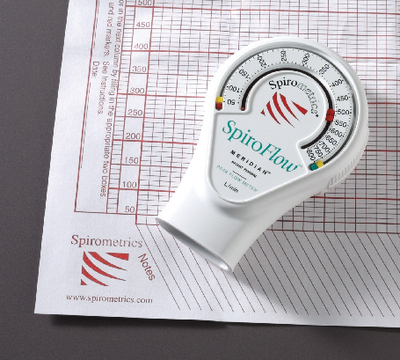 This compact, dishwasher safe monitor made of high-impact plastic features a scale that measures both standard and low-range peak flow measurements. It includes instructions. Range: 50–800 liters per minute. Size: 3 5/8"L x 2 1/2"W x 1"D.